Note: The AOA protocol implementation is quite old and may not work with newer Android devices. No support is given on the AOA implementation. This is however still a nice communication platform. The AOAA Kit is a standalone platform for evaluation and prototyping electronic accessories for Google’s Android operating system. It lets you get up-and-running with AOA experiments immediately. The AOAA board is also suitable for experimenting with CAN, Ethernet and RF networks. 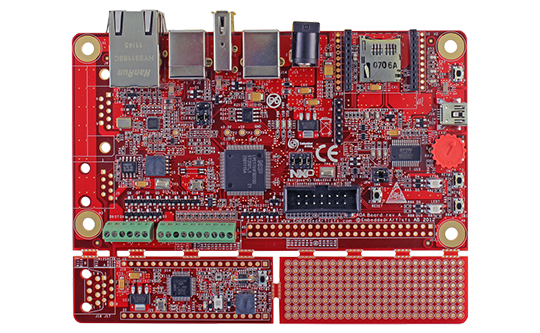 The board has been developed by Embedded Artists in close cooperation with NXP. It contains two microcontrollers from NXP, the LPC1769(Cortex-M3 core) and LPC11C24(Cortex-M0 core). The two microcontrollers are connected via an on-board CAN network. ISP over UART program download. Use the free tool Flash Magic to download a compiled application to the LPC1769 side of the AOAA board. Please note that this tool cannot be used to download code to the LPC11C24 side of the board. Alternativelt, use a debugger and JTAG adapter of your choice that supports the Cortex-M3 and Cortex-M0 ARM cores and more specifically the NXP LPC1769 and LPC11C24 microcontrollers. You might need an adapter such as the 10-pin to 20-pin JTAG Adpater Kit between your JTAG solution and the target board.